Local residents who frequently travel to Asia to visit family or conduct business can now fly directly from Ontario International Airport to Asia. These new flights offer a tremendous convenience to travelers and an exciting alternative to LAX. In other important economic news for the Inland Empire, Chinese businesses are showing interest in bringing manufacturing to the area due to the strong labor force and deep cultural ties to the Asian community. Bring the family to the Ontario Museum of History and Art on Saturday, February 20th for free admission to Dumbo, a beloved Disney movie. Light refreshments, crafts and other fun activities will begin at 2:30 p.m., with the screening at 3:30. The museum is located at 225 South Euclid Avenue and reservations are required. For more information on this special event, call (909) 395-2510. Fun Weekend Events for our Homeshoppers! 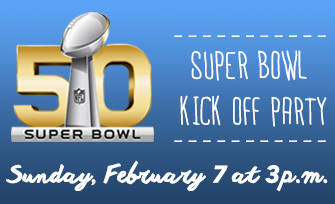 Join us February 7th for our Super Bowl Sunday celebration. Tour the community’s new model homes, then stop into The Clubhouse for refreshments and catch the championship game during your visit. If you prefer to tour New Haven’s model homes at a later date, mark your calendar for a special Valentine’s Day crafts event at Picnic Park on February 13th. From the big game to a handmade gift for your valentine, New Haven has a full calendar of events all year long! New Haven’s Super Bowl Party kicks off on Sunday, February 7 at 3 p.m. at The Clubhouse. Stop by for snacks, refreshments and score updates in between your model tours. Experience New Haven life, where there are always fun events and activities to enjoy! Your very own Lifestyle Director will be onsite to coordinate clubs, movie nights, holiday parties and more! Follow the New Haven Good Stuff Truck! Have you seen New Haven’s Good Stuff Truck around town? This vintage truck is cruising around bringing the good stuff to people throughout the town. Make sure you’re on the lookout for the truck to receive exciting swag from Frisbees and pinwheels to reusable totes for shopping at the farmer’s market. You’ll also get the latest news about the new Ontario homes at New Haven. You can keep up with the trucks latest happenings on social media with #NewHavenGST! There will never be a dull moment living at New Haven in Ontario Ranch. Buyers will enjoy a vibrant, social atmosphere with an array of opportunities for leisure and recreation just steps from the new homes in Ontario. The Clubhouse and Picnic Park will feature a family pool, kid’s splash zone, super playground, picnic areas and more creating the ideal places to connect with neighbors and spend time with family and friends. Watch a video tour of the community’s amenities and experience what New Haven has to offer!